India Home’s programs end around 2:00 pm most days. Even as the Program Staff are winding down, we notice our seniors patiently waiting in the lobby, sometimes as long as 45 minutes. Some of them have canes or walk with difficulty. They are waiting for their rides home, and sometimes they wait a very long time. Every once in a while, our staff have even had to drop a tired senior home. 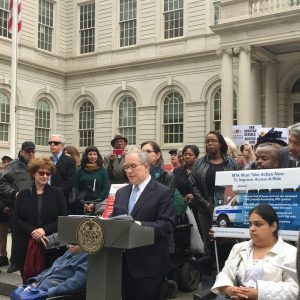 On Tuesday, May 16, India Home was happy to see much needed attention being brought to the problem of dropped or missed Access-A-Rides by Scott Stringer, the New York City Comptroller. 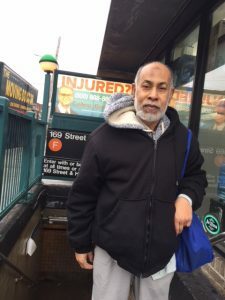 India Home’s Meera Venugopal was there, representing our seniors, as the comptroller announced an audit (click here for the report) of MTA’s Access-A-Ride program. He accused them of waste, mismanagement and service failures even as the MTA paid them $321 million in calendar year 2015. Seniors have been badly served by MTA. City Comptroller Scott Stringer announcing the audit at a press conference. India Home was there. 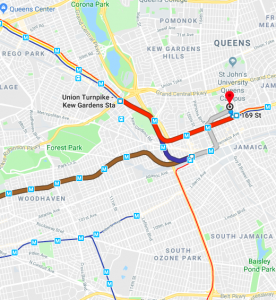 Seniors and passengers with disabilities unable to take subways and buses, were stranded over 31,000 in the past year, because Access-A-Ride failed to show. However, the service providers blamed the customers (who are seniors and people with disabilities) for the no-shows. Which is bad, because the MTA can use a no-show to cut people who need it the most, from the program. Plus the service providers fudged the numbers to make themselves look good. So the MTA may have paid nearly $130,000 for car service trips that never occurred. Which is a huge waste of tax payer money. Comptroller Stringer proposed several reforms to hold the MTA, Access-A-Ride and drivers accountable to set standards. India Home’s seniors agree completely.